Gadgets (or widgets) are usually compressed web pages that do one thing. They're powerful and interesting because you can use them to aggregate in a single page the things that are important to you. But each gadget has its own existence and it's not influenced by other gadgets, the page doesn't have the necessary cohesion and you often need to have to enter the same settings more than once. Imagine you want to visit London and you create an iGoogle tab about London. You'll probably add a gadget that displays maps, a list of interesting places, news about London, weather. But the map gadget can display any map, so you need to enter "London" in the settings or as a query. Each gadget has its own settings and you can't click on a place and see it one the map or change the location from the map and see the weather for your new place. The gadgets don't talk to each other and don't share their settings. The problem was solved by PubSub, a system that "allows multiple gadgets on the same page to send and receive data from each other". Of course, the gadgets need to be updated with the types of accepted messages. Probably the first interesting collection of PubSub gadgets is the Google Finance tab that basically recreates most of the Google Finance functionality from pieces. 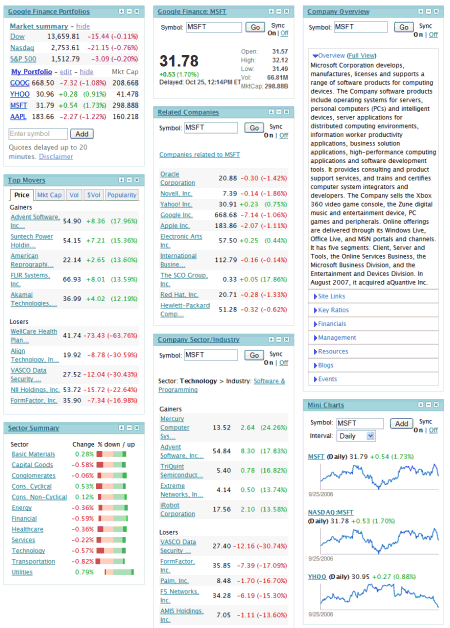 The first three gadgets show data from the homepage (your portfolio, top movers, sector summary), while the other five show information about a specific company (stock value, charts, competitors), but you only need to enter it once. Google Finance also announced an API that allows gadget developers to integrate financial information. "The gadget API for market data provides a framework so developers can display stock market information from the American, Nasdaq and New York stock exchanges within a gadget on Google properties. Unfortunately, due to data licensing restrictions, we couldn't open this API for display on any platform," informs one of the many official Google blogs. I think we'll see more and more full-featured collections of gadgets that deliver a lot of functionality by aggregating data from different places, while still providing a unified experience. To see what is all about, add the Finance tab to your personalized Google homepage and try to imagine other creative uses of the synchronization system. Depending on what you try to get from the Web, decomposing the web and rearranging its fragments may be appropriate or not. If you want to get a lot quick information most of the time from different source, gadgets can be very good. If you want to get knowledge, full page is mostly good.